I hate to start a post with an apology for how little I’ve posted – but that’s what I’m going to do. Although I’ve been posting regularly at my photography web site (where you’ll be able to find photos of the trips I’ll describe below as I post them), I’ve managed to neglect this site for weeks! So, some reports on recent Sierra backpack trips…. Near the beginning of August I spent four days doing photography at Young Lakes in the Yosemite high country out of Tuolumne Meadows. I’ve been to Young Lakes several times in the past and I thought it was about time to devote some significant time to photography at this location. The weather was, uh, “interesting” – but that is actually better for photography. I’d rather have some spectacular clouds, occasional soft filtered light, rain, and interesting sunset conditions than have a week of typical Sierra summer perfect blue skies! By the time I arrived at Tuolumne Meadows to start my trip I knew that the weather was going to be special. I stopped at the Meadow Grill just after noon to grab lunch before hitting the trail, and while I was inside there was quite a downpour of hail. With the precipitation starting so early, it was apparent that the weather would be an issue, so I decided to swap out my bivy sack and take a small one-person tent instead. Not only would that be better in real rain, but since I was going to base camp in one location for three nights the luxury of the small tent would be welcome. I headed up the trail past Lembert Dome in light sprinkles that continued off and on throughout the afternoon and evening. Given concerns about the weather and my somewhat late start I did little photography on the hike to lower Young Lake. This turned out to be a decent decision since it rained harder as I approached the lake and in the end it was after 7:00 p.m. when I finally arrived – leaving just time to set up the tent and make dinner before night fall. I was lazy the next morning, but for the rest of the trip I managed to get up early for morning photography, find myself in interesting places for late photography, and even do the cross-country walk out to Roosevelt Lake, which I’ve wanted to visit for some time. This is a bit of a different walk than the cross-country hikes I tend to prefer. While my favorite cross-country routes are at or above timberline – where you can go pretty much where you want to go – the first half of this hike from Lower Young Lake to Roosevelt travels through some fairly thick (for the Sierra) forest. The basic idea is that you keep a point just to the left of Conness peak in mind as your goal, and you triangulate back to Ragged Peak and the ridge it sits on behind you. Then you try not to lose/gain too much elevation as you travel through the forest area, dodging large drop-offs and other obstacles and generally following a slight loop to the right of what would be the straight line between the start and end points. Eventually I came to a meadow and creek at the base of a climb to the saddle leading to the valley holding the lake. I climbed this, keeping to the right of the creek, and finally entered to open country in this high valley. From here the path to the high, barren lake is fairly straightforward – with great views of the west face of Mount Conness all along the way. While this walk was great fun, it was not a great photographic opportunity given the midday time frame. I had better photography luck with early morning photography of the forest around the lower Young Lake and with evening photography at this lake and (especially!) at the more open and alpine upper Young Lake. My next trip (with my talusdancers buddies) was to have been a weeklong adventure in the upper Kern drainage. It would have taken us in via Kearsarge and Forester Passes and then out by way of formidable Shepard Pass. A variety of things interfered with the original plan. Several people had to cancel at the last minute. I had a dental problem at the last minute. And on and on… So, we improvised and came up with a less aggressive alternative trip – a four day/three night basecamp trip up high into the Sabrina Basin in the eastern Sierra above Bishop. I almost didn’t make this trip either! The night before the trip, literally as I was finishing my packing, I cracked a tooth! Fortunately, I was essentially packed and my dentist saw me the next morning. By noon I had a temporary crown on the tooth and I was making last minute arrangements to meet my friends in the eastern Sierra. I was on the road at 2:30 and arrived at Four Jeffrey campground at about 9:00 p.m. Whew! On the second day we moved up higher into the basin, finally ending up at Topsy Turvy Lake. This is a wonderful rock-filled lake at the base of a talus slope in country that is heavily affected by glaciation. Nearby are a bunch of interesting lakes: Midnight, Moonlight, Sailor, Hungry Packer, and more. The terrain above is my favorite in the Sierra, beginning with open meadows with small clumps of trees interspersed with lots of glaciated granite and much running water. We managed to visit most of these high lakes and I had opportunities to wander about wtih camera and tripod and photograph this wonderful terrain. On the final morning we go up relatively early – some earlier that others. Ernie was up and on the trail a bit after 6:00; I was on the trail perhaps an hour or so later; while Owen had a lazier morning. We all hiked the mostly descending trail back to our cars below Sabrina Lake by about noon – just in time to head down to Bishop for lunch pizza. Early this month (August 4-12, 2008) I completed a tran-Sierra pack trip with my talusdancers friends. I still plan to eventually post “the story” along with photos, but since the trip was two weeks ago and I still have work to do on the photographs I’m writing up a quick overview here with the day by day account to come later. The broad outline of the trip was to travel the “High Sierra Trail” west to east from Crescent Meadow in Sequoia National Park (located very close to Moro Rock), over the Great Western Divide at Kaweah Gap, up the Kern River canyon to Junction Meadow and the climb up Wallace Creek, down the John Muir Trail (JMT) to Crabtree Meadow, and then over the peak and out to Whitney Portal on the east side. I have been on sections of the trail several times, especially in the area in and to the east of the Kern, I followed the HS Trail out to the cutoff to Elizabeth Pass on my first solo trip many years ago, and my wife and I did the whole HS Trail many (many!) years ago. I was interested to see how much of the route would seem familiar to me. The first challenge for a trans-Sierra trip is setting up the car shuttle, and it is a major issue on this trip. The drive between Whitney Portal (where we left two cars) and Three Rivers (where we stayed the night before the trip) takes about four and a half hours – and we would need to repeat it at the end of the trip in order to retrieve the cars left at Crescent Meadow. As far as I can tell, there is simply no good way to avoid this issue. At Crescent Meadow the trail begins in relatively lush forest (by Sierra Nevada standards) with ferns beneath the trees in places, and then it quickly crosses a gap in the ridge after which the trail largely contours along the north side of the canyon of the Kaweah River as it heads toward its source on the Great Western Divide. The trail alternates forested sections with wide open sections affording expansive views of the canyon, the Great Western Divide, and the foothills of the Central Valley. We passed Mehrton Creek – where I camped on my first trip through here – and continued on to our camp at Nine Mile Creek. On the next morning the first portion of the trail was not terribly different from what we had hiked on the first day – mixed forest and open terrain and at roughly the same elevation. After a short distance and a small climb we arrived at Bearpaw Meadow where there is a ranger station and a backcountry camp much like the High Sierra Camps in Yosemite. We all stopped to enjoy the now close-up view of the peaks of the Great Western divide before continuing on. At this point the terrain began to change as the trail followed a rather “interesting” route along rocky cliff ledges above the increasingly steep valley below. After crossing a major creek on a new bridge (from which you could ponder the wreckage of the old bridge below) the trail began the climb into the basin holding Hamilton Lakes. The climb is not too bad, but at the end of the day it seemed somewhat hard. We soon arrived at popular Upper Hamilton Lakes, from which we could view the route for the next day’s hike to Kaweah Gap. The next morning some of us started early in order to get a head start on the steep 2500′ climb to Kaweah Gap, while others got a later start. The trail climbs steadily across the headwall of this basin, and includes some quite impressive examples of trail engineering – including the only “trail tunnel” I’ve encountered in the Sierra. Near the top of the steeper section the trail crosses wildflower fields fed by many small stream, and soon after that it arrives at Precipice Lake. (You may know this lake from a very famous Ansel Adams image shot in 1932.) We paused here – and I tried to pay homage to Ansel with a few photos of my own – and then headed on up the rather alpine final section to the gap, passing by small tarns and alpine meadows before this high point. From here the view opened to the east to the Kaweahs and to the south down Big Arroyo, into which we descended to reach our camp site at the old cabin along the creek. On day four we began the climb to Chagoopa plateau, the large flat area at the south end of the Kaweahs between Big Arroyo and the Kern. After reaching the plateau – and wondering about the gathering clouds – we walked another mile or so and then turned off on the loop to Moraine Lake, our next camp. On the next morning we began by crossing the Chagoopa Plateau on a trail that went through meadows and forest (many of which showed sights of fire) and past expansive views of Kaweah Peak before rejoining the High Sierra Trail. After this junction the trail began the large descent into the Kern River Canyon, and we gave up all of the elevation we had gained up until this point and then some by the time we hit the canyon floor. We passed over a very rough section of “new” trail that bypasses the old route along the river as we headed upstream to the Kern Hot Springs – where anyone in their right mind would camp and soak in the riverside rock pool. After considering the rest of our itinerary and realizing that we had to do at least one really tough day to finish according to our plan, we decided to make the next one our long day. We started early with the fairly easy 7.5 mile walk up the Kern to Junction Meadow, rising perhaps 1000′ or so in this distance. We took a long lunch break here and then started the real climb of a bit more than 2500′ to the JMT junction at Wallace Creek. I think we all know that this 13 mile day with a 3700′ climb would be tough, but we all managed to avoid mentioning it in conversation – which is one way to deal with a challenge like this. Suffice it to say that we were tired when we arrived at the JMT and set up camp in the late afternoon. The following day’s hike wasn’t so tough. We started with the section of the JMT that rises south of Wallace Creek, crossing moraines, forests, meadows, and a few intermediate valleys on its way to Crabtree Meadow. This is the location of another backcountry ranger station and the last place that one doesn’t have to use “wag bags” (look it up…) so we had considered camping here. However, this would have increase the total climb to the summit of Whitney the next day by about 1000′ and by several miles – so we decided that it would make more sense to head on up to the traditional “last camp before Whitney” on the west side, Guitar Lake. Finally, the next day was summit day. Most of the group intended to camp on the summit of Whitney, but I have some breathing issues at night that made me inclined to not join them. With this in mind I got a bit of an earlier start than most of the group. The hike up from Guitar Lake is somewhat serious business – in climbs very steadily and the elevation can take an increasing toll on speed and endurance as the trail rises to the trail crest. We all met up at the junction with the trail coming up from Whitney Portal before heading on to the summit, with me carrying only photo gear and a few other items and the rest of the group equipped for a night on the summit. After the inevitable summit photos, I left them to their high camp and headed back to pick up my pack and head over the crest and on down the east side. I passed by the “trail camp” at the base of the first section of steep switchbacks and kept going to Outpost Camp, where I joined a lot of other backpackers, most of whom were likely headed up the peak the next day. There isn’t a lot to say about the final day since I was only perhaps three miles or so from the trailhead, a distance that I completed by mid-morning – with time left for a huge breakfast at the Whitney Portal store. (You have never seen a pancake as big as what they sell there. Really.) By midday the whole group had arrived – reporting that they had a good overnight on the summit – and it was time to put the reverse car shuttle in motion. And that’s it for now… Photos later. I see that Gambolin’ Man has posted another trip report, this time on Point Reyes National Seashore. 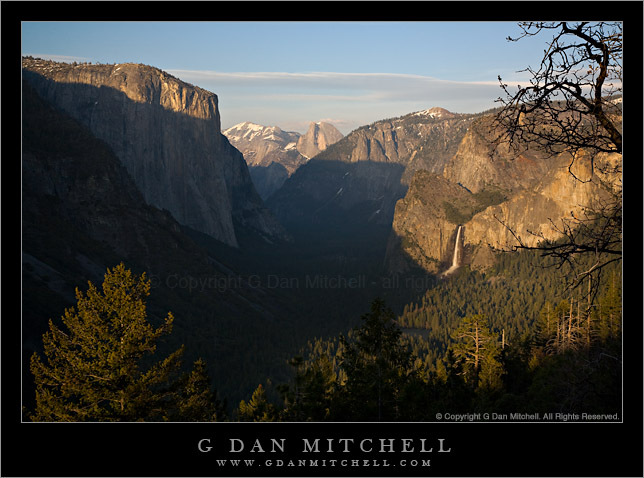 April 28, 2008 Posted by gdanmitchell | Commentary, Sierra Nevada, Trails, Yosemite	| Comments Off on Inspiration Point – a Better Valley View?